Don Burke, who last month shared with us a visit to the Amish of Ethridge, Tennessee, is back with photos from the community at New Wilmington in western Pennsylvania. This time, Don’s wife Pam joins him for a little commentary on their visit. I’ve had the chance to visit New Wilmington a couple of times, the first time 10 years ago. I made it the topic of one of this site’s early posts. As Amish settlements tend to do, this one has grown in the ensuing years (while not in the top 12, it’s one of the largest). The 2017 Raber’s Almanac has New Wilmington at 19 church districts in size; could they be around 2,500 strong now? Since then we’ve had several other posts on this settlement, including on Teena’s Quilt Shop (which Don shares photos of below), a shot from outside a school Christmas program, and on a local benefit auction. I’ll let Don and Pam take it away now. Don: In 2016, after 34 years of public school teaching, my wife (Pam) retired. This meant that we were finally able to make a long-awaited autumn trip through New England. And what’s a New England trip without a few stops in Amish country along the way? We were wrapping up a short stay in the white-top and yellow-top buggy region of Big Valley, PA, and started towards home. 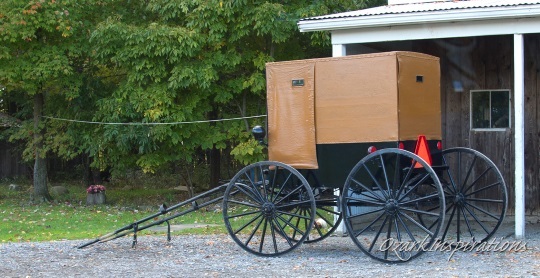 At the last minute we decided to add a very short side-trip to the brown-buggy Amish of New Wilmington. Pam: We drove into New Wilmington and weren’t sure where to go to find the local Amish community. 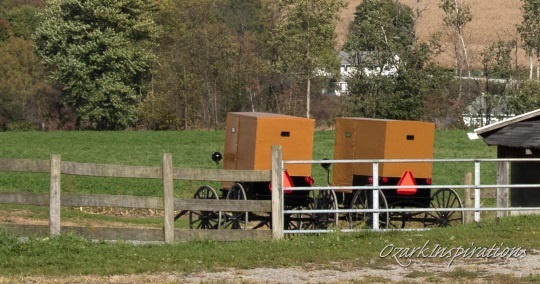 After a little driving, we saw a buggy – our first time to see the brown-topped buggy – and followed the direction it went out of town. 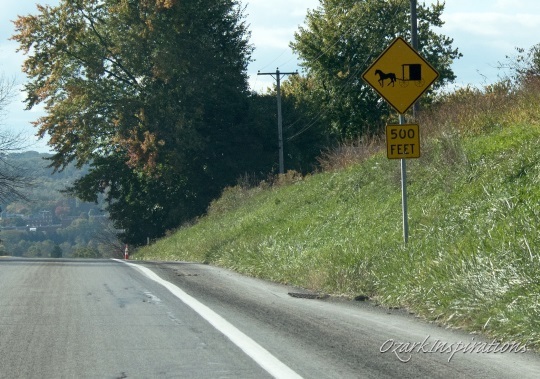 As we drove down the highway, we began to see some evidences of Amish life – more buggies, signs for Amish businesses, laundry on the line or porch, Amish farms and equipment, and purple martin birdhouses common to Amish life. 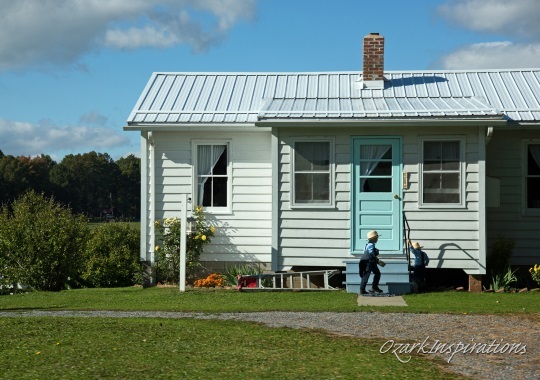 At one house, we saw a couple of small Amish boys playing around the front steps to the house. 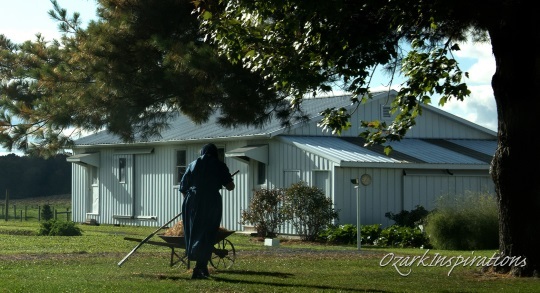 At another, there was an Amish woman working in the yard. 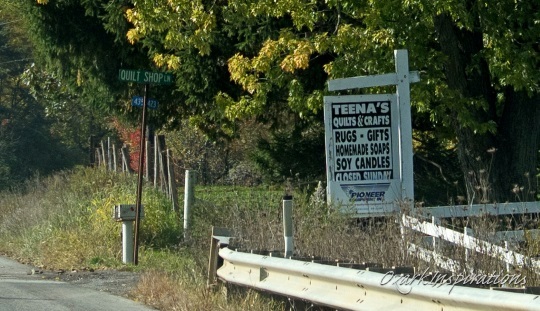 At one side road, I saw the kind of sign I’m often looking for in Amish communities – one offering baked goods. It gave the days and weeks of operation, and we were there on the right day. So we turned and followed the sign. 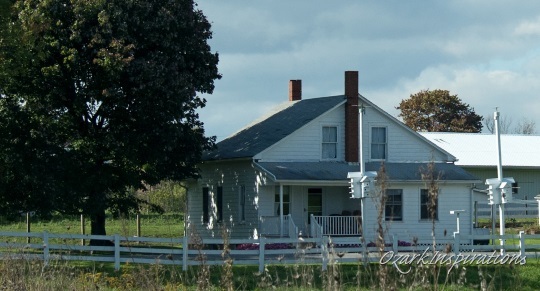 As we approached the home, an Amish gentleman – presumably the husband/father – was moving a team of horses from his house to his neighbors. We drove on up to the house, where we were greeted by the wife/mother of the home and her daughter, who was probably 8 to 10 years old. They had baked goods on display on their porch. They also had some aprons and other items for sale. We visited with them a few minutes and bought a couple of containers of cookies. While we visited, they pulled out a spiral notebook and told us that they liked to keep track of where visitors were from. I think we might have been their first from Missouri. Don: Without a doubt we normally have a better visit when we do a little research and know what we can about the community beforehand. When possible this includes getting a copy of the settlement’s map from the Amish Directory of that state or region. But as our experience here shows, even for a last-minute decision to go without any directions at all, if you just watch for the signs (figuratively and literally) rarely will you go away without seeing something that makes the trip worthwhile. Find more of Don’s photos at flickr. 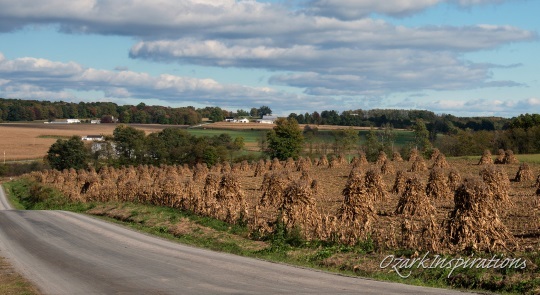 Thanks, Don, for sharing your pictures and describing your visit to New Wilmington, PA. I haven’t been to that area in my travels, but may have to look it up one day when traveling in that direction. Always enjoy your posts and pictures. Thanks, again, for sharing! Thanks for your kind words Kathy. And keep an eye open, I think Erik will soon be posting a three-part series with more of my pictures ‘fore long. Thank you Don for sharing your adventures. I hope the upcoming 3 part series has a few pictures of the inside of the Amish Quilt Shop. Debbie, my apologies, because I think I may have given you the wrong impression. The upcoming series is not about the New Wilmington area, so I hope you won’t be too disappointed that it won’t include the Quilt Shop. I don’t want to let the cat out of the bag, but I will say that it’s from a Missouri Amish community, and when I featured pics from this same series on my personal Amish facebook page, it drew some of the biggest traffic that my pics have ever seen. So, stay tuned — I don’t think you’ll be disappointed. Thanks Don and Pam for sharing your awesome pictures and commentary!! I really enjoyed seeing them and reading about another Amish settlement. I really need to get back down to Arthur, IL but I doubt it will be this year. Perhaps in the spring I will make a trip and share some photos too? Thank you, Alice. We’ve made a quick pass through Arthur once, but really didn’t have a chance to see much. It is a place that I’d like to get back to sometime as well. I love New Wilmington!! Hubby and I went for the first time over Labor Day weekend and it was very enjoyable. So peaceful, quiet, less traffic and not commercialized like Lancaster County or Ohio Amish country. The Amish are very friendly and the countryside is beautiful. We are planning to go back before the snow flies. I could see how New Wilmington could be just like you described it. I know a person or two that lives in the area, and they describe it that way as well. I would love to spend more time there, but it’s a long was from where we live (near St. Louis), so that one time through there might be all that we ever get to see of it. Hope you enjoy your visit there. New Wilmington Pa is just over an hour and a half away. I’ll have to take a Sunday drive one of these days… Except we don’t do Sunday drives. I live so close to so many settlements, I really should go visit, but M’honey doesn’t enjoy them as much as I do. He takes me out to Geauga and Trumbull counties on the motorcycle do it works for us both. I wouldn’t be able to ride to the others. I’ll go visit someday. Thanks for writing a piece on New Wilmington, PA Amish community. New Wilmington is one of the most beautiful areas in western PA.
Of course, the Amish community attributes to that beauty significantly. 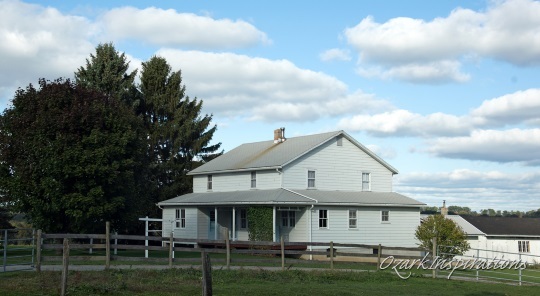 They have beautiful yards with little ones out playing or ladies tending to groomed gardens, quaint school buildings, beautiful fields, clothes hanging in the breeze using the pulley style, farms and barns on their land, etc. 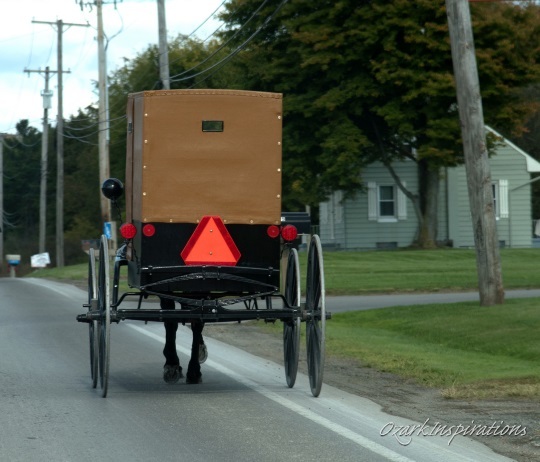 All Amish Auction goers….there is an auction the first or second Saturday in June annually. It has actually grown in size since we have been going. Quilts are bountiful. Western PA has several Amish areas: Mercer, Greenville, Kennard/Atlantic, and Stoneboro / Sandy Lake, and Cochranton area. It is always nice to travel through any of these scenic areas. Congratulations Pam upon your retirement! I , too, am a retired public school teacher. You will enjoy retirement and wonder when you ever had time to work! 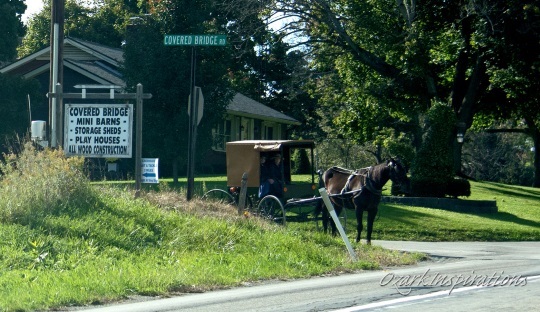 I actually taught in the Stoneboro/Sandy Lake PA area so enjoyed my ride to / from work daily…enhanced with little Amish kids in their barefeet waiting for buses, the sound of the horse drawn buggies, the beautiful farm layouts, etc. Thank you, Don and Pam! Always fun to learn tidbits and see pictures of the various Amish settlements. I live in Eastern Washington and tend to live vicariously through those of you that have been able to visit Amish areas. I’m glad that you enjoyed the visit, Christine — even if it is vicariously. Since you have so little access to the Amish, please feel free to visit my online photo albums where I’d estimate that approx. 1/3 of the 20,000+ pictures there are from my/our trips to various Amish communities (some 50+ communities in a dozen states, at last count). 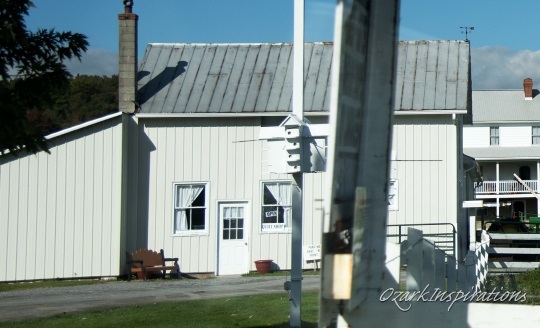 The link to the Amish collection (sorted by communities) is https://www.flickr.com/photos/ozarkinspirations/collections/72157669494234850/ . Additionally, if you’re on facebook you can stay abreast of my most current additions by visiting and liking my PlainSong page: https://www.facebook.com/PlainSong1/. Thanks, Don — I actually do follow PlainSong1 on FB 🙂 I will check out your photos on flickr. So many Amish settlements are greatly commercialized, especially in Ohio and Indiana. The towns often look and feel like they’re staged and that you’re in a type of theme park and not in a real community. Fortunately it is not at all the way it is with the New Wilmington, PA Amish. If you’re in town you might not even believe there are any Amish in the area, there are no stores with Amish goods, no restaurants with Amish family style food. You’ll probably not even see a horse or buggy, it’s instead a rather quiet small college town with only a few choices in shopping or eating out. 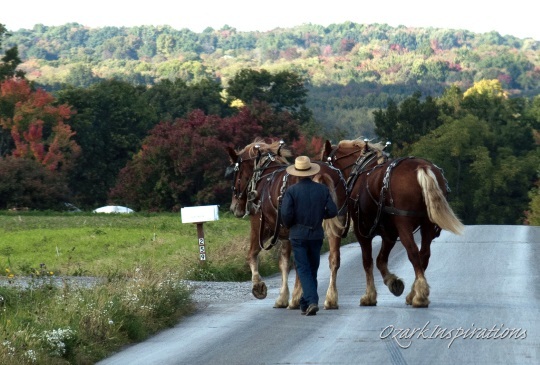 To experience the Amish you need to leave town and go into the countryside. There you’ll see signs for their goods posted near the road. You may find a small store on a farmstead, or more likely homemade rugs, toys, baskets, canned and baked goods, in someone’s simple and shiny clean parlor or kitchen. There are usually a few barefooted children close by and certainly a mellow dog and a mama cat and kittens. You’re helped by an older child or a friendly adult with an easy manner who’ll be glad to tell you about their offerings for sale and perhaps something about their community. The countryside is beautiful, clean, unspoiled and quiet. You may feel as though you’ve left the modern world temporarily and you may wonder if we’ve given up too much of what’s really good and important about life. If you don’t need to be entertained, or overstimulated by a lot of touristy stuff, and if you can appreciate a slower, quieter, simpler, more authentic place and people, then this is a wonderful place to visit. Good description from what I recall of the town Gary, I had a similar impression, though it seemed like a pleasant place. 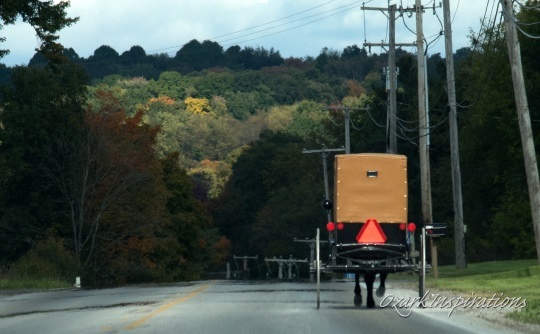 I may have seen a buggy or two during my admittedly brief visit but not a lot of signs that Amish frequent it often like other places which I would consider “Amish towns” (there are many examples like Nappanee, IN or many towns throughout Holmes County, OH). I had the pleasure of visiting the first time during early autumn which was really nice. I was in New Wilmington 2 weeks ago. I grew up about 10 miles from there, about the same as the Mercer-Jackson Center settlements. Teena (at the Quilt Shop) and her sister just wrote a book on their childhood – parents originally Amish, children raised English, then the children placed back with other Amish family members after their father couldn’t care for them. 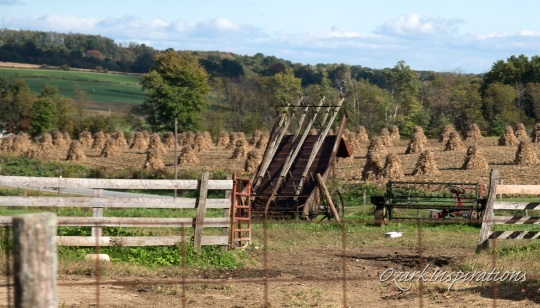 This is a nice time to be back there – the NW Amish schools take a week off for corn husking, so you’ll often see ears of corn flying above the standing corn and wonder what’s going on until you see the horses emerge at the end of the row.